Glow all the way to the finish line with Magic Tracks Super Starter Kit! This bright glow-in-the-dark race track features endless track combinations for even more ways to play. Race through tunnels and over bridges on tracks that glow green, blue, yellow and red the second you shut out the lights. 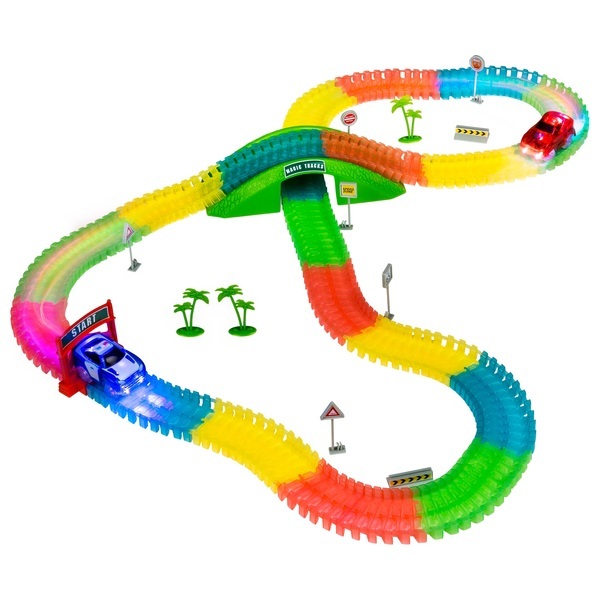 Build an epic speedway in no time with Magic Tracks Super Starter Kit! The 220 track pieces are simple for young racing fans to put together. Pieces just snap into place! Bend and flex the tracks to make a thrilling 3D race track. You can bend the tracks to make hills for the included cars to drive up and down, or join track pieces into a loop for a glow-in-the-dark hamster wheel your car can whizz around. You can even angle the tracks so the car is half off the ground when it races! The Magic Tracks Super Starter Kit includes 2 light-up cars that illuminate the track. Their headlights make a glow-in-the-dark race shine even brighter! Race past trees, road signs, through tunnels and overridges on 11 feet of track! Create an infinite variety of speedways for hours of racing fun, by day or night. Customise your track set with the included sticker sheet for a unique race.